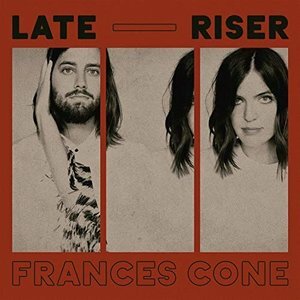 Whether brooding and ghostly or defiant, eclectic, and rambunctious, Frances Cone's Late Riser is filled with melodious poeticisms and gripping arrangements. In an industry focused on quick turnarounds and commercial expectations, Nashville singer-songwriter Christina Cone is an anomaly, as she chooses instead to wait and work patiently until her next artistic vision is fully realized. Hence the title of Late Riser, her soulful indie-pop full-length follow-up to 2013's debut album, Come Back. Recorded under her newfound guise, Frances Cone, and alongside her partner, "drummer-turned-bassist" Andrew Doherty, the relatable collection delivers its confessional and exploratory themes via a characteristic merger of singer-songwriter sparseness and resourcefully full-bodied arrangements. Thus, its disordered and calm in equal measures and familiarizes the duo as a poignantly creative team. Officially, Cone explains that the LP is about "giving yourself time to create, rest, and grow while also being frantically afraid of its speed", as well as "the impermanence of time" (i.e., living in the present and being weary of the future). The original plan was for her remain a solo artist as Frances Cone (named after her father and great-grandfather), but when she met Doherty, she knew he had to be involved because he was her "partner in several ways", not the least of which was as a producer and sporadic songwriting foil. Influenced by Chopin, Rufus Wainwright, Justin Vernon, and Patti Griffin—to name a few—Cone and Doherty use traditional and atypical methods to bring Late Riser to life; luckily, the gestation period proves quite justified. Whether brooding and ghostly or defiant, eclectic, and rambunctious, Late Riser is filled with melodious poeticisms and gripping arrangements. Cone has certainly grown as a performer and scribe, and the upfront technical skills of Doherty— in addition to the multifaceted support he no doubt provides behind-the-scenes—are invaluable in bringing her odes to life. Let's hope that it doesn't take the duo another half-decade to produce a third effort, but if it's on the same level as Late Riser, it'll surely be worth the wait if it does.